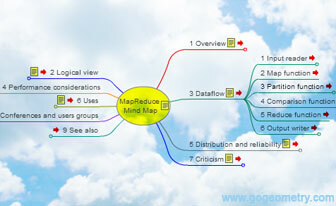 MapReduce, Interactive Mind Map. Software Development. Interactive Mind Map based on MapReduce by Wikipedia . 'MapReduce' is a framework for processing parallelizable problems across huge datasets using a large number of computers (nodes), collectively referred to as a cluster (if all nodes are on the same local network and use similar hardware) or a grid (if the nodes are shared across geographically and administratively distributed systems, and use more heterogenous hardware). Read more.